Grindrod is an unincorporated designated place in the North Okanagan Regional District, British Columbia, Canada. The community is located on the western bank of the Shuswap River, north of Enderby, and is sometimes considered to be part of the Shuswap Country. The population was 1,453 at the 2011 census. ^ Google (July 12, 2013). 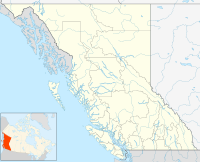 "Grindrod, British Columbia" (Map). Google Maps. Google. Retrieved July 12, 2013. ^ "Census Profile – Grindrod, UNP, British Columbia (Designated place)". Statistics Canada. March 1, 2013. Retrieved July 12, 2013. This page was last edited on 12 July 2013, at 20:42 (UTC).